Keep your security in focus with the many features of AUTODOME IP 5000 IR cameras with integrated IR technology from Bosch. The camera is carefully tuned to deliver detailed 720p25/30 or 1080p25/30 HD images during daylight and full details under low-light or no-light conditions with the integrated IR illuminator. The intelligent IR illuminator automatically adjusts the IR intensity according to zoom and field of view to ensure that the scene is illuminated uniformly. The AUTODOME IP family makes it easier for you to stay in control of your security even when you’re on the go. 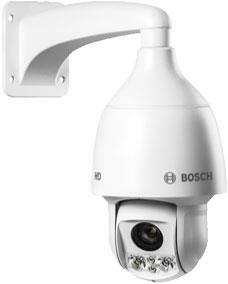 When used in combination with the Video Security App from Bosch, the camera supports Dynamic Transcoding technology, which allows you to stream high-resolution H.264 video, to pan/tilt/zoom the camera, and to search recorded clips remotely through mobile devices such as smart phones or tablets, all on a low-bandwidth network connection (up to 50% less than other H.264 PTZ cameras). The camera provides complete network-based control of all functionality including pan/tilt/zoom operation, presets, tours, alarms, and web-based configuration of all camera settings.